Britannia's Electric Portraits Ltd operated in Peterborough from around 1924 to 1971. They were at 14 Long Causeway and from 1964 at 15A Long Causeway, Peterborough. By 1958 the firm was described as "Britannia Studios (Passport and Commercial) 5a Market Place, Peterborough Tel 5126". In 1968 there was a Britannia D and P Works at 15B Long Causeway, Peterborough. Surviving portraits by the firm suggest that they operated in around thirteen English towns, but who was behind the company and what is its story? Despite the title suggesting this was a limited company, no trace of the firm has yet been found at Companies House, in The London Gazette or The National Archives. Where did the company start its operations? Young Lady RECEIVER wanted for studio. Apply Britannia's Electric Portraits Ltd, 17A Market Place Grantham. "Britannia's Electric Portraits Ltd, Dudley Studios, 259 High Street, Lincoln. On account of important reductions in the price of some photographic materials and to the installation of the latest electric printing machinery at our works we have been able to revise our prices and now offer: Postcards from 4/- per dozen, Cabinets from 9/- per dozen, Sketch portraits from 10/- per dozen and enlargements from 7/6d each." The Lincolnshire Echo carried an advertisement on 27 February 1923 p1 "
Smart business girl (18-20) required to learn receptionist's duties and make self useful. Apply Britannia's Studios 259 High Street Lincoln. Who were the people behind the firm? Given these early traces of the firm in Grantham and Lincoln, who was or were the person or persons behind the company? There were a number of photographers in Grantham at this time. The Grantham Journal on 16 March 1918 reported that photographer Frederick W GRAY had been convicted of contravening the wartime blackout regulations by having an unscreened light at his premises at 17 Market Place. He was fined 7s 6d. The Grantham Journal on 6 October 1917 p6, reported that Charles SWEET, photographer of 1 London Road Grantham was summoned for not obscuring lights on 25 Sept 1917. A series of weekly advertisements from 8 Sept 1917 - 8 February 1919 showed that the Belvoir Studio, 1 London Road, Grantham, was under new management, by Charles Sweet of Rothesay, whose own studio was closed because of the war. Sweet was described as "well known as a Medallist for Artistic Photography in the Photographic World. His Patrons include the late King Edward, Queen Maud of Norway, and many of the Most Distinguished of our Nobility." On Sat 1 March 1919 there was an announcement in the Grantham Journal that the Belvoir Studios, corner of London Rd and St Catharines Road, Grantham, had been reconstructed and thoroughly altered for the production of high class photography in all branches. Then on Saturday 19th August 1919 there was an announcement of the amalgamation of the Belvoir Studio with the photography business of Frank Urwin, 34 St Peters Hill Grantham and that all negatives from A.M.Emary's business would be transferred to 34 St Peters Hill from where the amalgamated business would operate as "Frank Urwin, The Belvoir Studio". The Lincolnshire Kelly's Directory for 1919 shows Britannia's Electric Portraits operating at 259A High Street, Lincoln and 1 London Road, Grantham (premises formerly known as the Belvoir Studio). The 1913 Kelly's Directory shows that the photographer at 259A High Street, Lincoln was Horace Dudley. The photographer at 1 London Road Grantham in 1913 was Alfred Miller Emary (1878-1953), but by 1939 he was living in Torquay where his occupation was shown as a bank cashier. So Emary may have simply sold his premises to Britannia's Electric Portraits. Nothing has been found to date to suggest that Emary was involved in establishing or running Britannia's Electric Portraits. The 1913 Kellys Directory does not show a photographer at 17A Market Place Grantham. There were no photographers at any of these addresses in the 1900 Kelly's Directory. Of these names, the one most directly connected with the Britannia Studio at 17 Market Place Grantham was Frederick W Gray. Was Gray the driving force behind the company of simply a manager of a branch at Grantham? Frederick Gray b. 1873 Hartlepool, and his wife Margaret, b. 1874 Middleton Yorks, both shown as photographers and employers, were living in 11 Queen Victoria Street, Leeds, in 1911. In 1901 the couple were living in Scarborough where Frederick was a yeast dealer working from home on his own account. There are two other names connected with the Britannia firm which appear in newspaper reports. The Lincolnshire Standard and Boston Guardian, 21 January 1928, p9, reported: "Mr Oswold Gregson, a well known photographic artist has taken up the position as manager at the Boston branch of Britannia Studios, Emery Lane. Mr Gregson has had considerable experience in London, Belfast, Dublin, Glasgow and Manchester having been chief operator for Messrs Lafayette, Chancelloe and Elliott and Fry respectively. Among other notabilities he has photographed the present King and his father King Edward. Mr Gregson is an enthusiastic advocate of food reform and the promotion of health of the people. He gave an address on the Ten Commandments of Health at the PSA meeting on Sunday." By the 19th May 1928 however, Oswold Gregson announced in the same newspaper that he had set up his own studio in the town. In 1929 the Nottingham Journal (1 Jan 1929 p22) carried a photograph, sent to them from Africa, by Mr Arthur C Watts, a former Nottingham resident who was for many years the "inspector and supervisor to Britannia's Electric Portraits Ltd Shakespeare Street Nottingham". Watts was, in 1929, the Chief Photographer to the African Expedition of the Aircraft Operating Co Ltd of London, then engaged on an aerial survey of the Zambese River. In the British Journal of Photography, 22 May 1925, the firm, (address 72 Shakespeare Street, Nottingham) advertised D and P work for other studios "these will go through with our own work ensuring quality and despatch" In the Nottingham Evening Post 14 July 1925 p2 the firm was advertising, in addition to photography, developing and printing services for all photographers: A photographic dealer is not necessarily a photographer. Let us develope your films. We specialise. All spools developed at one price 3d each. Britannia's Electric Portraits Ltd, 72 Shakespeare Street and 20 Long Row. Later that month their advertisements for D and P work claimed they were " the largest finishing works in the Midlands". At 3d per roll of film, the firm was undercutting the local competition for amateur D and P work, and as a result was censured for not maintaining the usual standard charges at the local meeting of the Nottingham and District Professional Photographers Association (British Journal of Photography 25 October 1925 p 613). (We are grateful to Michael Pritchard for these BJP references). Horace Dudley, might possibly have had an involvement in the firm. Despite the fact that Britannia's Electric Portraits Ltd had a grand sounding and futuristic name, they kept the name "Dudley Studio" in their advertisements as part of the address of their Lincoln Studio, at 259A High Street. Their 1919 Lincoln advertisements also suggested that Britannia's Electric Portraits had been trading for some time previously. So what was the connection, if any, between Horace Dudley and Britannia's Electric Portraits? Did Horace Dudley simply sell his Lincoln studio to another company called Britannia's Electric Portraits, or did the Britannia name point to a brand created within or alongside the Dudley Studios? The only overlap between towns of operation appears to be Lincoln and Nottingham, which might support the argument that these two photographic empires were two parts of one whole enterprise. The first postcard below suggests that Lincoln may have been the firm's only studio 1round 1920-21. The postcard shows a portrait of a young couple, the lady standing while the gent perched precariously on a flimsy table. The lady is displaying an engagement ring on her right hand, so this may be a photograph taken to celebrate the couple's engagement. 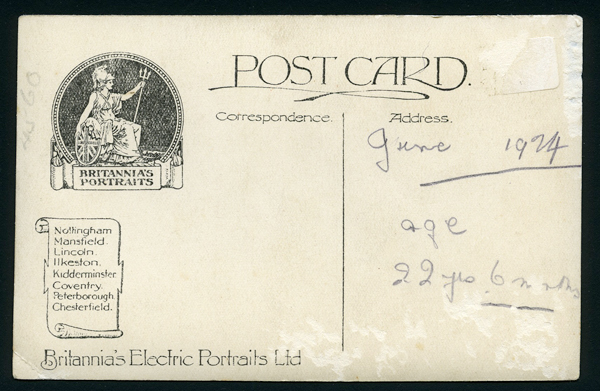 The postcard has "Britannia's Electric Portraits Ltd" printed on the reverse (no address given) . On the face, in the bottom rh corner is embossed "Britannias 259 High Street, Lincoln". Other postcards which have been seen from Britannia's Electric Portraits, including others illustrated below, list multiple studio locations. On his PhotoDetective site, photo historian Geoff Caulton has a page on his research into the horseshoe logo within a stamp box, as seen on this postcard. All real photo postcards start off as pre printed sheets of photographic card. In some cases the printing carries the manufacturer's branding or logo. In this instance the stamp box with the horseshoe and initials TIC indicates that the postcard stock was made by Thomas Illingworth and Co. Geoff Caulton has compared many postcards bearing this logo and has noticed that between the words "Post" and "Card" are one or two symbols. From cards which have been dated by their owners, Geoff has established that these symbols are likely to be date codes for manufacture. 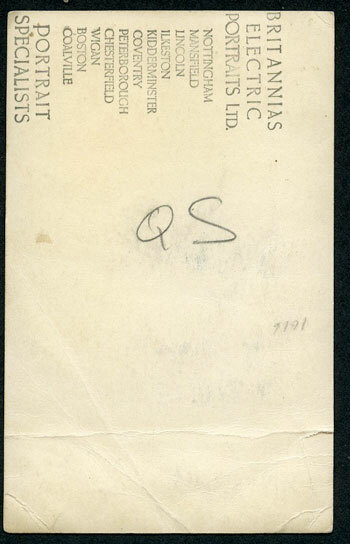 The postcard shown below has two "X"s which Geoff has calculated relate to 1920 and 1921. So was the firm only operating the one studio, in Lincoln, at around this point in the early 1920s, or did they, at one stage, only show on their products the address of the studio supplying the image? 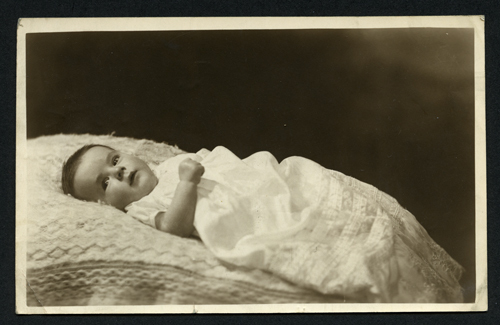 The next example below is a postcard sized print of an unknown child - the reverse shows the name of the photographer to be Britannia's Portraits, with studios at three locations: Nottingham, Peterborough and Boston (but not Grantham or Lincoln). It is difficult to date this, possibly from the 1920s. 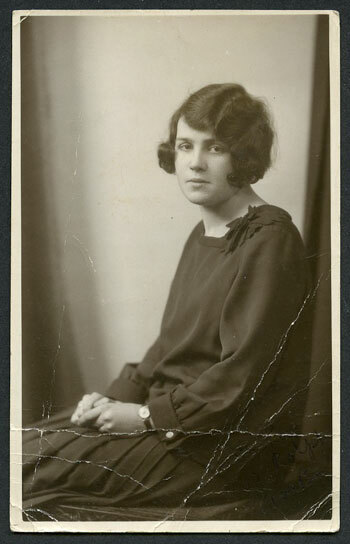 Next is a postcard sized portrait of an unknown young woman who has dated the photograph June 1924. 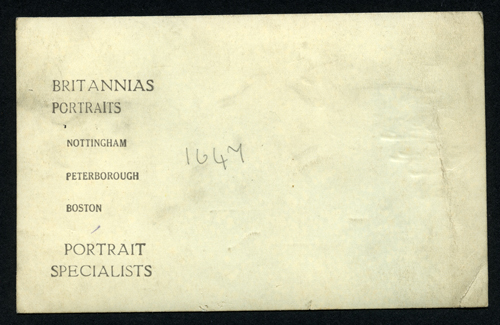 From the reverse it can be seen that Britannia's Portraits by Britannia's Electric Portraits Ltd were then available from eight locations: Nottingham, Mansfield, Lincoln, Ilkeston, Kidderminster, Coventry, Peterborough and Chesterfield. This particular postcard is from the Lincoln Studio - in the lower right corner it stamped with a hand embossing machine "Britannia's 259 High St Lincoln". 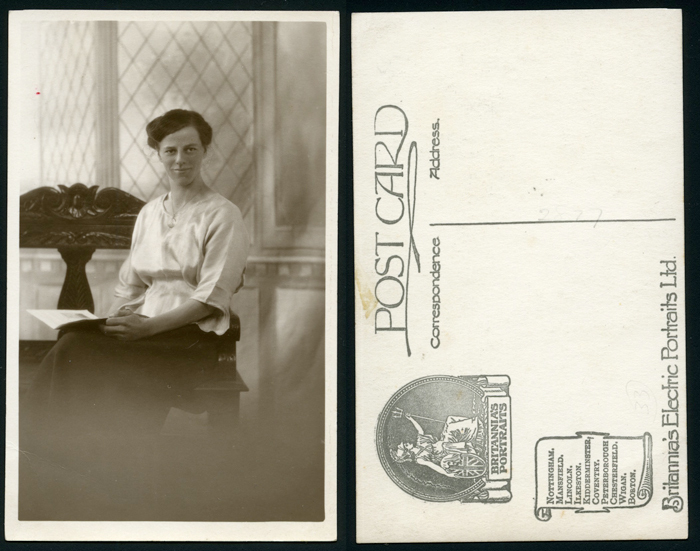 Next is a Britannia's Portraits postcard portrait of a seated lady on an unusual carved bench, studio unknown. The reverse shows Britannia's Portraits then operated from ten locations, Wigan and Boston being the last added. 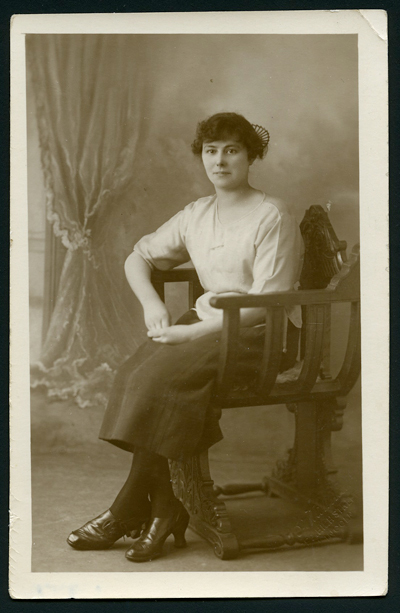 Below this is a 1930s postcard sized print of a seated young lady. On the reverse of this is the name of the firm "Britannia's Electric Portraits Ltd" with branches listed in 11 towns (the previous ten plus Coalville). Britannia's Peterborough premises were taken over in 1955 by Campkins and the premises were managed for them until 1964 by Eric Milward, then by Reg Wilcox. The Peterborough Advertiser Directory 1925, 1927, 1961. 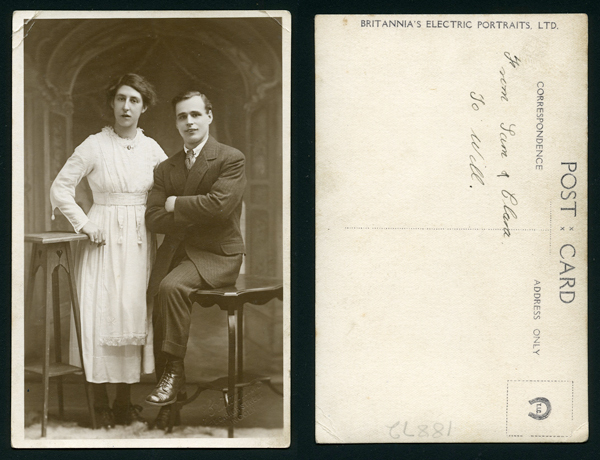 Clearly much remains to be discovered about Britannia's Electric Portraits Ltd and we would be delighted to hear from anyone able to contribute further to this unfolding story.